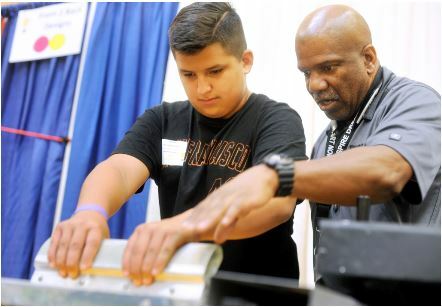 SUISUN CITY — Leslie Ruelas, an eighth-grader at the Public Safety Academy, got to sample life as a screen printer Tuesday morning at the second annual Inspire: Dreams Start Now Interactive Career Fair at the Kroc Center. The event, a partnership between the Kroc Center, Fairfield-Suisun School District, the Fairfield-Suisun Chamber of Commerce and the cities of Fairfield and Suisun City, is open to eighth-graders. More than 1,600 students were expected to attend. With assistance from Charles McCullar, owner of Front2Back Designs, Ruelas created her own souvenir, a white T-shirt with a logo for the event designed by McCullar. Prior to putting the shirt on the screen printer, Ruelas said she learned how much pressure it takes to get the design on the shirt and how to work with multiple colors. “They don’t learn this all at one time,” she said. Ruelas, a self-described art lover, said she could she herself in the business. She’s not ready to decide yet because she also has a passion for nursing and law enforcement. Front2Back Designs gave out 200 T-shirts last year at the career fair. The company was on track early Tuesday morning to meet that number. Dionne McCullar said the students’ enthusiasm was obvious. “This shows them different options and avenues,” she said. A few booths away, fellow PSA student George Estes listened as Alex Haynes, co-owner of A Squared, a video production and marketing company, talked about his work and showed off some cinematic lenses. Estes said he would like to get into film as a career. He and his fellow students make their own videos now for class projects. Haynes saw his role Tuesday to inspire and encourage youth to think outside the box. It was also a chance to give back to the community that helped him and co-owner Alex Quinn launch their company. “As a kid I wanted to be an actor,” Haynes said. “My parents told me, ‘no.’ ” He’s now found his passion behind the camera, not in front of it. Leon Ingram, from the David Weir Preparatory Academy, dreams of playing for the Chicago Bulls one day. 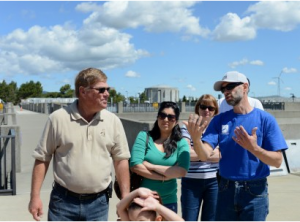 Tuesday he learned about working at the Fairfield-Suisun Sewer District. Meg Herston, an environmental compliance engineer, and Nellie Dimalanta, a geographic information system technician, demonstrated, with help from the students, what happens to items flushed down drains. Ingram poured the ammonia for the demonstration. With a miniature model of a clarifier, the students watched the oil and grease stay on top, the heavier items go to the bottom and the clean water remain in the middle. Debi Tavey, president of the Fairfield-Suisun Chamber of Commerce, said the event makes her feel good about the future. “They are so interested in the businesses here,” Tavey said of the students. Jerome Spaulding, who teaches at Oakbrook Elementary, was impressed with an addition this year – a passport to help the students explore the fields that interest them based on personality questions. “They can learn a lot about of variety of jobs that fit their personality and desire,” Spaulding said. Reach Amy Maginnis-Honey at 427-6957 or amaginnis@dailyrepublic.net. Follow her on Twitter at www.twitter.com/amaginnisdr. FAIRFIELD — Earth Day got celebrated in many ways this weekend with a cleanup in the Suisun Marsh and along area creeks, events at the Civic Center Park and a tour of the Fairfield-Suisun Sewer District’s treatment plant. The plant serves 135,000 residents in the Suisun City and Fairfield area. The amount of wastewater from homes, businesses and commercial users traditionally adds up to about 15 million gallons per day going through the system, but that’s not currently the case. While the plant serves everyone who lives and works in the two cities, its out-of-the-way location on Chanbourne Road gives it an out-of-sight, out-of-mind kind of existence. That’s something plant officials and staff sought to counter on a day set aside to bring awareness to the health of the planet. Baatrup has worked for nine years at the plant and said he loves his job. The Fairfield-Suisun Sewer District has been a local provider of steady work for many of the employees who can say that they have worked at the plant since getting out of college. “I have been here 20 years and done probably every job imaginable,” Assistant General Manager Talyon Sortor said. The plant is situated on several acres of grassy plain near the Suisun Marsh. In addition to the sewer tour, plant workers also hosted a booth at the Fairfield Civic Center for the city’s Earth Day activities and went out for cleanup activities in Fairfield and Suisun City. Back at the plant, they offered visitors refreshments and drinks. Robin and Mike Westfall of Fairfield have been residents since 1975 and have done tours of the Jelly Belly factory and Anheuser-Busch brewery, but this was their visit to the treatment plant. The wastewater disposal plant discontinued using chlorine because of safety issues for storage but also because releasing the treated wastewater into the marshlands with chlorine could harm the marsh, Sortor said. “It’s good to know they are protecting the marsh,” said Robin Westfall. SUISUN CITY — Nearly 1,300 middle school students will explore one of the last intact wetlands in the Bay Area as part of the 2015 Suisun Marsh Watershed Program. About half of the sixth- and seventh-graders who are participating have already experienced the daylong field trip to the Solano Land Trust’s Rush Ranch – with another 600 students scheduled to participate next month. A major goal of the program is for as many students as possible to participate, said program Coordinator Marianne Butler, education program manager for the Solano Resource Conservation District. The free program includes in-class lessons about marsh and watershed ecology, leading up to the field trip to explore part of the largest contiguous brackish tidal marshes remaining on the West Coast, according to a district press release. Students hike through the wetlands and study the soil, water and plants there. In the day’s final activity, participants hike to Overlook Hill and write poems about their experience, which their teachers submit to the River of Words International art and poetry contest. Back in their classrooms, students complete additional lessons covering the problems and solutions to ocean debris and water conservation. The program’s five in-class lessons instruct students about the marsh’s ecosystem and its role in the larger watershed habitat. Program educators tie the ecology and health of the marsh to the student’s own lives, building understanding of the interconnection of all life in a watershed, according to the district release. The Rush Ranch open space is a working cattle ranch, which serves as a living laboratory for participants. Students see wildlife coexisting with domestic animals in a well-managed environment, on a 1,050-acre property that represents more than 10 percent of the remaining wetland area in California, according to the district. The eight-year-old program was developed by the Solano and Suisun resource conservation districts and is funded by the Solano County Water Agency, along with a State Parks Habitat Conservation Fund grant, which is in its final of four program years. The funding is augmented by a two-year grant from the Benicia Sustainability Commission, and a small amount of funding from a CalRecycle Grant to Solano County. Additional funding support for busing is provided by the Fairfield Suisun Sewer District. When completed, more than 10,000 children will have taken field trips to explore county open space in a hands-on program that aligns with state standards and addresses local concerns, the district said. Reach Kevin W. Green at 427-6974 or kgreen@dailyrepublic. 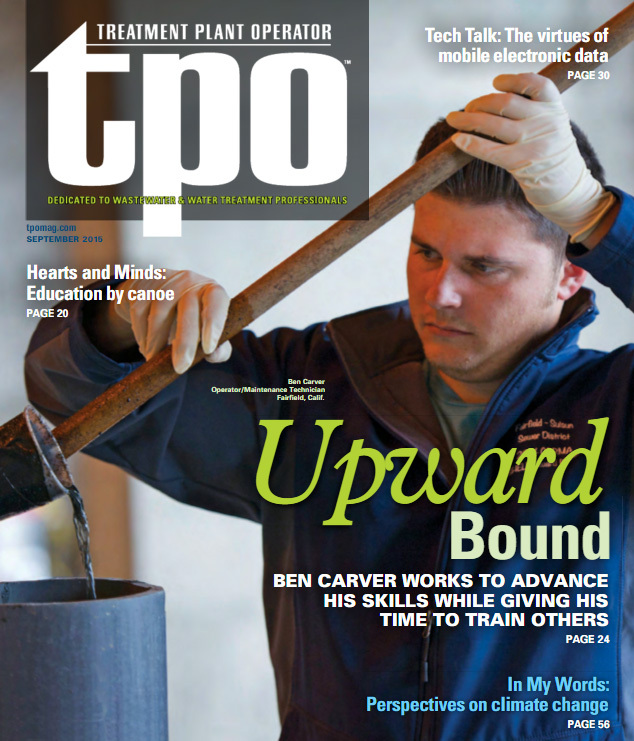 Ben Carver loves the wastewater industry. As an operator/maintenance technician 5 at the Fairfield-Suisun Sewer District in California, Carver is focused on expanding his knowledge while helping fellow operators develop the skills they need to advance their careers. After just nine years in the business, Carver has parlayed his passion for wastewater into a senior role at the district’s 23.7 mgd (design) advanced secondary wastewater treatment plant. Sited on 300 acres, the facility operates under reduced flow (14 mgd) due to California’s five-year drought, water conservation measures and the San Francisco Bay Area’s economic doldrums. 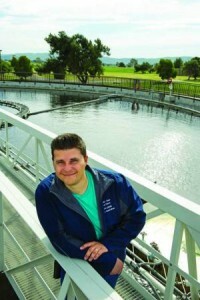 Carver, a Fairfield native, is serious about his role in producing clean water for the 41-square-mile area of Solano County that comprises the sewer district. It includes the cities of Fairfield (population 108,000) and Suisun City (28,000) as well as Travis Air Force Base. Beyond kudos from colleagues and supervisors for his dedication to training new and mid-level operations and maintenance technicians, Carver has gained broader recognition. In 2014, he received the Plant Operator of the Year award from the 9,000-member California Water Environment Association (CWEA). Earlier in the year, he won the same award for the CWEA’s Redwood Empire Section. Carver’s interest in wastewater began when he was 15 and trying to figure out what to do with his life. A family friend who worked for the City of Fairfield Water Department described life at the water plant, leading Carver to look at classes at Solano Community College. The first one he found happened to be about wastewater, so he enrolled and decided to make it his career. At 18, he volunteered at the Fairfield-Suisun Treatment Plant. After graduating from Vacaville High School in 2005, he landed a job at the plant with contractor United Water. In July 2008 he joined the sewer district, where he has made professional development a priority. From then on, every year, he has advanced his state certification, starting with an operator in training certificate and culminating with Grade V in 2011. Almost from the day Carver arrived, the 40-year-old treatment plant has undergone expansions. In 2007-08, a secondary treatment expansion added a biological nutrient removal (BNR) system. The plant converted its old aerobic digesters to aeration basins with anoxic zones, built two new circular clarifiers, and converted a flow equalization tank to an intermediate clarifier. Another project was a dewatering upgrade in which Carver and his colleagues replaced old filter presses with a screw press (FKC Co.), replaced two dissolved air flotation thickening tanks with gravity belt thickeners, and built a circular primary clarifier to add capacity to four existing rectangular clarifiers. 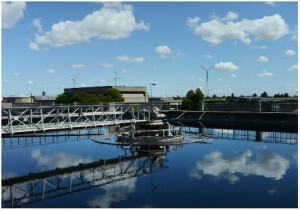 In 2011, the plant switched from chlorine to UV disinfection (WEDECO – a Xylem Brand). Crews also built a new alternate discharge pump station for discharging effluent to the Suisun Marsh, the largest contiguous brackish-water marsh remaining on the west coast of North America and a critical component of the 116,000-acre San Francisco Bay Delta estuary ecosystem. A typical day for Carver runs from 6 a.m. to 4:30 p.m. Each day is different, but he usually supervises the morning meetings and briefings from graveyard shift operators, checks the duties for the day, and assigns tasks. Carver supervises the lower-level technicians and provides training when needed. Training covers wastewater treatment processes, equipment handling, plant maintenance and other aspects of the job, such as maintaining the district’s four main pump stations that deliver wastewater into the plant, nine lift stations and eight stormwater stations throughout the area. Carver has little time for accolades. 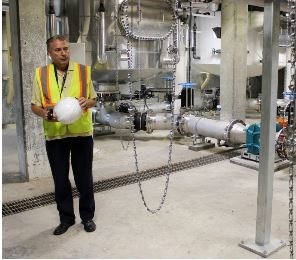 He’s too busy doing his job: leading the operations team members as they work on the oxidation towers and dual-media tertiary filtration system, and making sure the solids dewatering processes — screw press and asphalt-lined drying beds — function properly to generate 7 to 8 dry tons of biosolids daily. He also helps conduct plant tours for elementary, high school and college students, promoting the satisfaction he feels from protecting the area’s fragile ecosystems. That includes reclaiming 10 percent of plant effluent to irrigate turf farms or livestock feed and to replenish ponds for local duck clubs. Looking ahead, the treatment plant faces stricter nutrient limits from the Regional Water Quality Control Board and the U.S. EPA. Carver relishes the challenge as he continues to improve his skills and look for ways to improve plant operations and efficiency. SUISUN CITY — Coastal Cleanup Day brought out local groups who rolled up sleeves and slid on gloves for the task of beautifying the waterways of Solano County. The goal for Saturday was to clean up the watersheds and waterways, emptying them of trash from as far away as Lake Berryessa to the creeks in Fairfield, Suisun City and Vacaville. Eleven sites were marked along creeks for cleanup: American Canyon Creek, Beldens Landing, Hill Slough, Laurel Creek, Ledgewood Creek, McCoy Creek, Serpas Ranch Open Space, Upper Dan Wilson Creek, Lower Union Creek and the Suisun boat ramp. Girl Scouts, Boy Scouts and Cub Scouts joined together at the boat landing in Suisun City to clean up the marsh area with the help of Anheuser-Busch Brewery employees, who helped organize the groups for the three-hour event. Angie Jones-Bateman of Fairfield brought her daughter, Gabrielle, 10, some work shoes because she wore her good shoes for the clean up. Her daughter just started Girl Scouts and so this was her first cleanup day. “This is a great opportunity for the kids because it gets them off the TV and off the cellphone and shows them what it means to help,” Jones-Bateman said. Cub Scout JaVonn Liggon, 9, of Fairfield, was working his third year of coastal cleanup and said he was excited to get back out into the marsh. “It’s fun because I get to help pick up trash, but I don’t like getting cut,” he said. This was a family day for JaVonn: His grandmother, Lory Hoffmann, who is Girl Scout troop leader for Troop 20287, and his grandfather, Geoff Hoffmann, who helps out with Cub Scouts and Girl Scouts events, were right there with him. Lory Hoffmann just began as troop leader. This was her first time leading the girls on a Coastal Cleanup Day. She brought seven girls for the activities and she noted that 20 Cub Scouts came out. “They are from several different troops,” she said. The day had multiple goals for the troop. They went after lunch to the Suisun Wildlife Center to drop off blankets, bleach and other items. The project helped them to earn their wilderness badges. The children were a ways into the marsh as they worked, which meant they all needed to be mindful of watching their steps and staying out of the water. “The worst really is the blueberry bushes, which cut you,” Lory Hoffman said. Mike Segala, owner of Segala Maintenance and Repair and a member of the City Council in Suisun City, brought his truck around so the children could pile the trash in the back. Segala said he has been doing this for longer than he can remember for both the city as a worker and for his business. He brought one bag out, which was filled with trash from kayakers on the water who wanted to help with the cleanup while they were fishing. “This is really a community event today,” Segala said. Each year he learns something new for efficiency of cleanup and tries to apply that the next year. This year he brought his truck out to the area where the children were collecting garage so they could just dump it in the truck and not have to move it to another area for pickup. He said police on Friday night moved a couple of homeless campers out of the area and it was really nasty where they had been camping. Despite the mess, Segala said he was pleased to see so many people working together to make the open spaces a better place for everyone to enjoy. 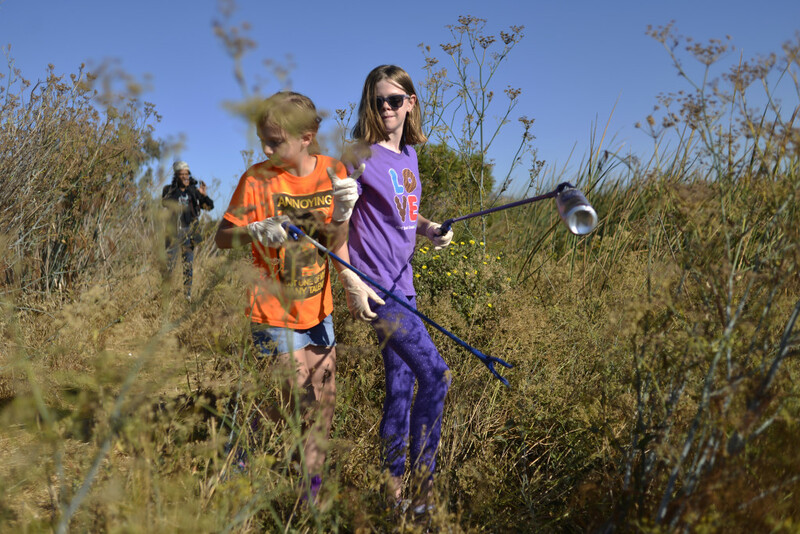 Marianne Butler, environmental education program manager for the Solano Resource Conservation District, said in a press release that 2,452 volunteers took part in Coastal Cleanup Day activities at 60 locations across the county. She said a total of 29,638 pounds of trash and 5,916 pounds of recyclables was removed from waterways across the county at locations that included 79 miles of neighborhood parks, hiking trails, bridges, creeks and lakes. May 19 2015 (Fairfield, California, U.S.A.) – Yesterday, staff of the Fairfield-Suisun Sewer District (FSSD) recommended, and the Board of Directors accepted, the approval of a Resolution to execute a 20-year lease agreement (with an additional 10-year optional renewal) between the FSSD and Lystek International Inc. (Lystek) for the development of an Organic Materials Recovery Center at its Chadbourne Road facility in Fairfield California. The major terms and conditions of the Agreement are effectively complete and both parties look forward to proceeding with project implementation. “This is an exciting day for all stakeholders”, said Rick Mosher, President of Lystek. “Approval by the Board to move this project forward is the culmination of months of positive discussion and careful consideration of the many, mutual benefits that will be realized by everyone involved in this development. This includes the FSSD, all surrounding communities looking for advanced and proven, Class A quality biosolids and organics management solutions, growers that want/need good, affordable, nutrient rich, bio-fertilizer products as well as those looking for good-paying jobs in the area “, he adds. It is widely acknowledged that “waste” diversion and resource recovery generate substantial economic and environmental benefits while supporting and expanding the evolution towards a circular economy. Founded in 2000, Lystek is an award-winning, biosolids and organics management firm that is playing a leadership role in the successful diversion of organic materials from landfills. The firm provides proven solutions that help municipalities and other generators harness “waste” as an economic resource thereby converting wastewater treatment plants into Resource Recovery Centers. This is accomplished by transforming these materials into an organically-based, bio-fertilizer product called LysteGro. The resulting, high nutrient product is pathogen-free and it meets (or exceeds) US EPA, Class A EQ quality standards. LysteGro is already in high demand because pathogens are eliminated and the product is high in nutrients and organic matter and far more cost effective than chemical alternatives. The same, innovative system can also be used to optimize the performance of digesters and BNR systems, while reducing overall volumes and increasing biogas production for green energy. The OMRC will be built under a Design-Build-Finance-Own-Operate (DBFOO) model by Lystek. FSSD currently produces approximately 12,000 tons of biosolids per year. Under this agreement, the district will have long-term control over its biosolids management expenses. Revenue and expenses will be proportional to the volume of material processed at the OMRC, which will have a maximum operating capacity of approximately 150,000 tons per year. FSSD biosolids management expenses will effectively be capped (except for growth and small, consumer price index increases) with revenues growing as more material is brought into the new facility. Indirect benefits will also be realized by FSSD through the process 2 of re-feeding “LysteMized” material back into its digesters to enhance biogas production for “green energy”) and through reduction in the overall volume of output. Under the terms of the agreement, Lystek will be responsible for soliciting third party materials to be processed at the new facility as well as all marketing and sales of the LysteGro bio-fertilizer product. As of the issuance of this release, Letters of Interest (LOI’s) have already been secured from several agencies in the Bay Area. Additional LOI’s are forthcoming. These LOI’s are expected to transition into multi-year contracts as the project moves forward. “The FSSD Board of Directors is extremely proud of the track record of success at the FSSD and pleased with staff accomplishments “ said Pete Sanchez, President of the FSSD Board of Directors. “We look forward to the positive benefits this partnership with Lystek brings to the communities of Fairfield, Suisun City, Solano County and the entire Bay Area,” he adds. Lystek International Inc. is an organic materials recovery firm that is helping municipalities and other generators reduce waste, costs, odors and greenhouse gas emissions through its innovative approach to biosolids and organics management. The multi-use Lystek system can be leveraged to optimize digesters and biological nutrient removal systems while also contributing to landfill diversion and agricultural sustainability. This is achieved by transforming non-hazardous, organic materials into nutrient-rich, federally-registered fertilizers and other, multi-purpose products. The Fairfield-Suisun Sewer District is a legally constituted governmental entity established to provide wastewater services to the Cities of Fairfield and Suisun City. FSSD serves more than 135,000 residential, commercial and industrial customers and government agencies in central Solano County, about 40 miles northeast of San Francisco. Households, retail businesses, major food and beverage producers, light industries, manufacturers and vital military operations depend upon our service. The treatment plant occupies about 150 acres. It draws from a collection system that consists of 12 pump stations and a 70- mile network of sewers that fan out throughout our service area.